The four-year-old Fondation Louis Vuitton in Paris pulled off a major coup last year by welcoming more than 1.2 million people to see Impressionist and Modern works collected by the Russian industrialist Sergei Shchukin between 1898 and 1914. The first-class assemblage of pieces by Matisse, Picasso, Gauguin and Monet, among others, was lent by Russian institutions to the Parisian private museum founded by the French billionaire Bernard Arnault. Although the Shchukin show boasts a higher number of overall visitors in our 2017 survey, we rank exhibitions by the number of daily visitors. 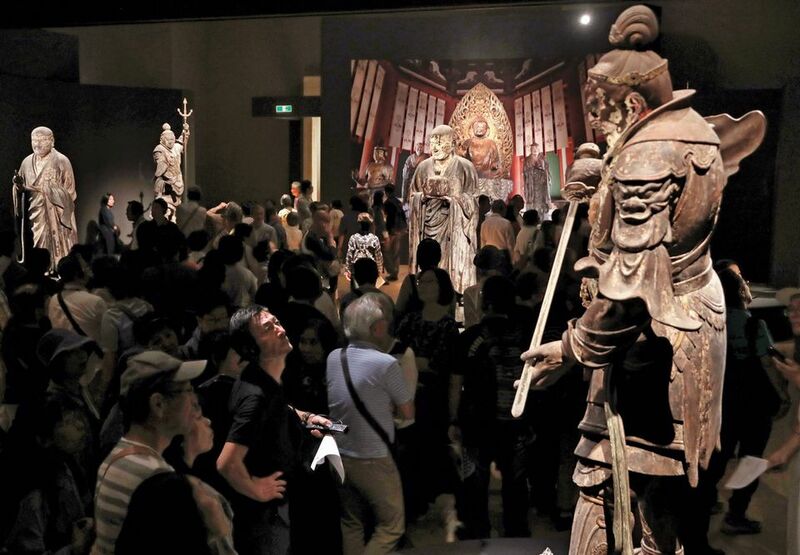 So, despite attracting 8,926 people a day, the exhibition comes second to a display at the Tokyo National Museum of 22 Buddhist sculptures by the renowned Japanese artist Unkei (around 1150-1223). The show, the first major retrospective of the sculptor, enabled the Japanese museum to reclaim the top spot after eight years. Around 11,300 visitors a day saw the exhibition—around 1,000 fewer daily visitors than when the gallery topped our 2010 survey with a show marking the 400th anniversary of the artist Hasegawa Tohaku’s death. There is a greater geographical spread to the top 20 exhibitions in our latest survey. Brazil, the UK and Taiwan have traditionally dominated the list, but as of 2017, we see Spain, France and Australia entering the fray. Many shows at Taipei’s National Palace Museum, except for its special exhibitions, have moved into our “big ticket” category this year (this covers shows for which you cannot buy individual tickets or entry is included as part of a wider attraction). French museums, which did not feature in our top 20 in 2016, claim four spots. A free, travelling exhibition celebrating the centenary of the Dutch Modern movement De Stijl (Mondrian and De Stijl; 6,700 daily visitors) at the Rio de Janeiro branch of the Centro Cultural Banco do Brazil (CCBB) is the only Brazilian entry to break into the top 20; the country had six in 2016, including the three most-visited exhibitions. But from 2015 to 2017, overall figures at the Rio and São Paulo branches of the CCBB dipped by 950,000 and 540,000 respectively, while the numbers at the Brasília and Belo Horizonte outposts went up. Anniversaries always help to boost visitor figures and last year was no exception. Programmes to mark the 20th birthday of the Guggenheim Museum in Bilbao contributed to Spain’s strong showing in our top 20. A retrospective of the video artist Bill Viola, “hero” works made by a 20-something Georg Baselitz and a film by the US experimental film-maker Ken Jacobs incorporating 19th-century footage by the Lumière brothers each drew more than 6,100 visitors a day. The festivities also helped to increase the museum’s overall attendance by more than 150,000 to 1.3 million—the second highest in its history. An altogether different kind of anniversary propelled Madrid’s Reina Sofía to the top of the league table: 5,200 visitors a day saw Picasso’s Guernica (1937) on the 80th anniversary of its creation. Other museums basking in an anniversary glow include Basel’s Fondation Beyeler, which celebrated its 20th birthday with a Monet show (2,300), the second most popular exhibition in the Swiss museum’s history, and the Museum of Contemporary Art, Chicago, which had 125,000 extra visitors in its 50th anniversary year. 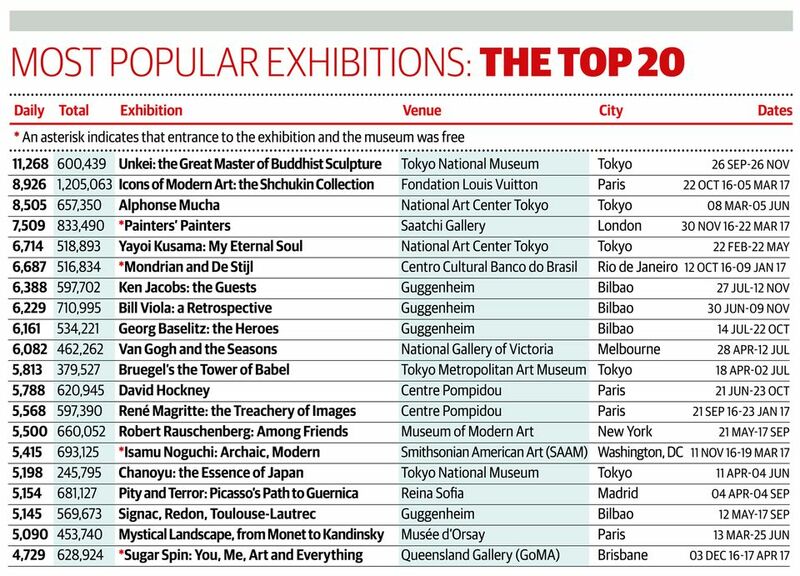 In Australia, Sugar Spin (4,700) at the Queensland Gallery of Modern Art in Brisbane just makes it into our top 20. The group show, which gave museum-goers the option to slide between floors courtesy of Carsten Höller’s Left/Right Slide (2010), was among the events staged by the gallery to mark its tenth anniversary. It had a record 1.4 million visitors in 2017—an increase of 760,000 on 2016. Another big jump in attendance Down Under was at the National Gallery of Victoria International, which had 540,000 more visitors in 2017 thanks to record attendance at its Van Gogh (6,100) and Dior (3,800) shows. Earlier surveys have shown that crowds go wild for Yayoi Kusama—travelling shows on the Japanese artist dominated our 2014 rankings—so the National Art Center Tokyo’s decision to stage a 270-piece Kusama exhibition for its tenth anniversary was a safe bet. The show (6,700) is the fifth most-visited exhibition in our survey and the top by a living artist. Kusama also contributed to a near-doubling of attendance at the Hirshhorn Museum in Washington, DC, from 659,000 to 1.1 million visitors. But the institution’s most-visited exhibition was an interactive Yoko Ono show (3,000) that allowed visitors to add wishes to the artist’s Wish Tree. Another museum in Washington, DC, that enjoyed a jump in attendance was the National Gallery of Art, which had one million more visitors last year after the opening in autumn 2016 of its expanded East Building, which includes more than 750 Modern and contemporary works of art. The San Francisco Museum of Modern Art also benefited from a recent expansion project: 1.1 million came out to see its $305m Snøhetta extension, which doubled the gallery’s exhibition space. 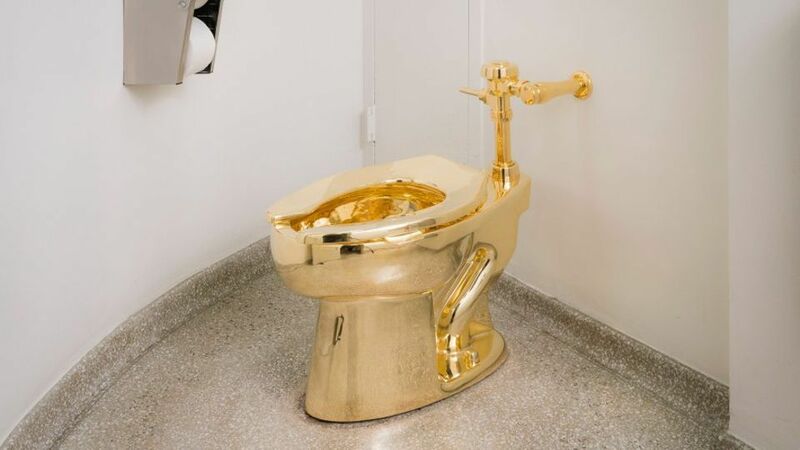 The Solomon R. Guggenheim Museum in New York had a rather unusual hit with America, Maurizio Cattelan’s fully functioning golden toilet. The work caused a stir when the media revealed that the institution’s chief curator, Nancy Spector, had offered it to the White House instead of the painting by Van Gogh that had been requested. With almost 3,000 visitors a day, the installation falls in our “big ticket” category, as it is difficult to ascertain how many people visited the work (and how many just needed a comfort break). But the Museum of Modern Art remains the leader in New York. Its Robert Rauschenberg retrospective (5,500) was the most-visited show in the city, drawing nearly four times as many visitors as its London presentation (1,500). It was a mixed bag for London’s public museums. Fewer blockbusters and tourists meant fewer visitors to the National Portrait Gallery and the British Museum, which had 677,000 and 514,000 fewer visitors respectively. The National Gallery, however, was the hardest hit, with a whopping one million fewer people walking through its doors in 2017. Beyond Caravaggio (2,100), which explored the Italian artist’s influence on his contemporaries, was the museum’s most popular show and London’s sixth most-visited fee-charging exhibition. Tate Modern’s attendance dropped by 183,000. Across the River Thames, however, Tate Britain broke its own record, welcoming nearly 1.8 million visitors. The 60% increase was helped by its retrospective of the UK artist David Hockney (4,300), which is the Tate group’s most popular ticketed solo show by a living artist—an accolade formerly held by Damien Hirst (Tate Modern, 2012; 2,900). But despite Hockney’s success in his homeland, more people queued to see the exhibition in Paris (5,800), making the Centre Pompidou show the second most popular in the French capital last year. The Victoria and Albert Museum (V&A) in London had its most successful year on record with just under 3.8 million visitors, thanks to an eclectic mix of programming that included a revealing history of undergarments, a hidden history of plywood and a psychedelic survey of the British band Pink Floyd. Surprisingly, more turned up to see the wonders of plywood (2,324) than Pink Floyd (2,258), probably because the former was free while tickets for the latter were among the most expensive in London. The V&A’s inauguration in September of its vast underground exhibition space with a multi-sensory survey of opera probably contributed to the overall increase (the show closed in 2018 and will feature in next year’s survey). The Saatchi Gallery saw its visitor figures jump by 800,000. The gallery typically does not charge admission fees, but when it hosted a paying Rolling Stones exhibition in 2016, its figures slumped by 573,000 from the previous year, which may explain the jump in 2017. Finally, the Design Museum’s move in 2016 to a revamped 1960s building with triple the space seems to have paid off; it had 704,000 visitors, a record for the institution. There is a discernible shuffle within—and a new addition to—the most-visited museums list. 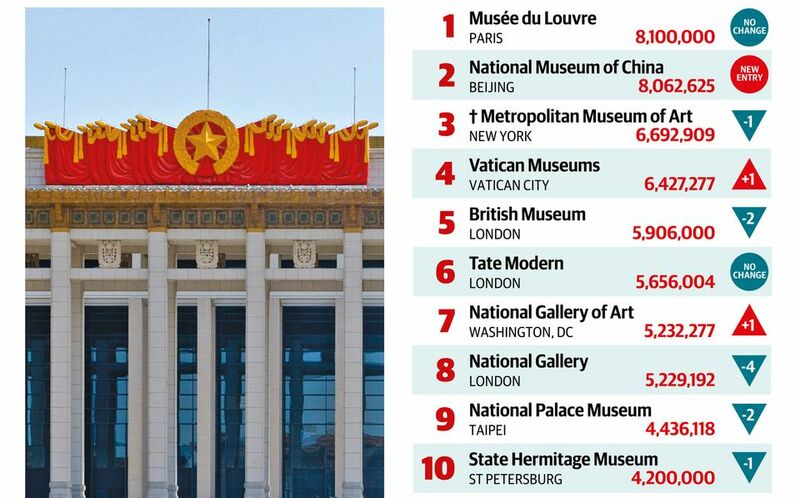 The National Museum of China, a behemoth on Tiananmen Square that boasts a collection of more than one million works, makes its first appearance in our survey (8,063,000) and just missed out on the top spot occupied by longstanding leader the Louvre (8.1 million), which is still recovering from a dip in attendance in 2016 following the terrorist attacks in the city (numbers fell from 8.6 million in 2015 to 7.4 million in 2016). For our latest survey, we have listed the attendance of institutions with more than one location separately. For example, Melbourne’s National Gallery of Victoria, which comprises two sites—the NGV International (2.5 million) and the Ian Potter Centre: NGV Australia (614,000)—each has its own entry. The daily figures are calculated automatically by our database, which computes the number of days for which an exhibition was open using the following formula: total number of days between start date and end date, divided by seven, multiplied by the number of days a week the institution is open, minus exceptional closures. All of the data used were supplied by the institutions concerned. Some institutions offer a number of exhibitions for a single ticket: these are shown as one entry. Exhibitions that were free to visit—ie neither the museum nor the show had an entry fee— are indicated with an asterisk (*).